Yesterday we saw the new white Jabara Stone, now Jabra has announced the launch of another Bluetooth headset, the Jabra Clipper. 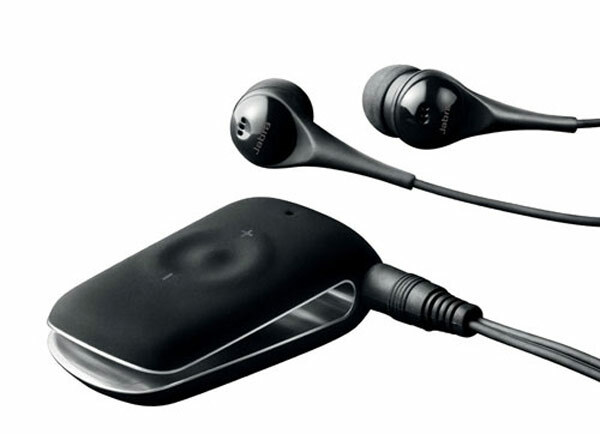 The Jabra Clipper is designed to be used with your Bluetooth mobile phone for making and receiving phone calls, and also with your iPhone, iPod or MP3 player to listen to your favourite tunes. The Jabra Clipper features a pair of noise cancelling headphone and the control unit can be clipped to your jacket or shirt, so the controls are always handy. The Clipper feature a rechargeable battery that will give you up to six hours of usage or up to eight days of standby time. The Clipper has support for Bluetooth 2.1+EDR and it weighs in at just 0.7 ounces and measures 4.8cm long by 1.5cm wide by 2.55cm tall. It will go on sale in May 2010 for $59.99.